The "Flying Pancake" pictured in the full scale wind tunnel. 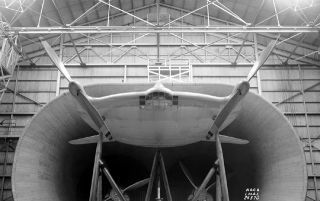 In this historical photo from the U.S. space agency, a view of the Vought-Sikorsky V-173 airplane mounted in the Full Scale Wind Tunnel on Nov. 28, 1941. This image shows the prototype "Zimmer Skimmer" or "Flying Pancake" on which the XF5U was based.